Ah yes, another item that was excluded from our Starry, Starry Night menu. It wasn't excluded on purpose. With all the commotion around the buffet, I didn't have room to prepare this! I resorted to making it on New Year's Day. 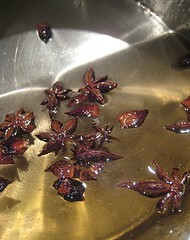 I prepared a star anise syrup by placing a few star anise into sugar and water and melting it. 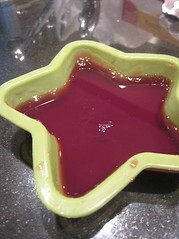 I also started making star-shaped pomegranate juice "ice cubes" days in advanced. I had only one of this star-shaped mold! JS also purchased a star ice cube tray from the dollar store (not pictured), but the molds were so deep and it was so hard to take the stars out that I gave up after one batch. I even injured myself trying to get them out! Of course, this would be great with champagne or sparkling wine instead of soda water! 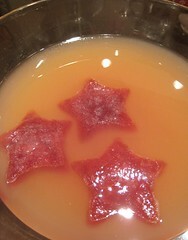 To finish, I added the frozen stars of pomegranate juice. Big ones for the big bowl, and small stars for individual glasses. They melted quite fast and started giving the drink its multi-hued appearance. Place sugar, water and star anise in a small pot. Heat over medium until the sugar has completely dissolved. This can be made in advanced. Place pomegranate juice in an ice cube tray and place in the freezer. 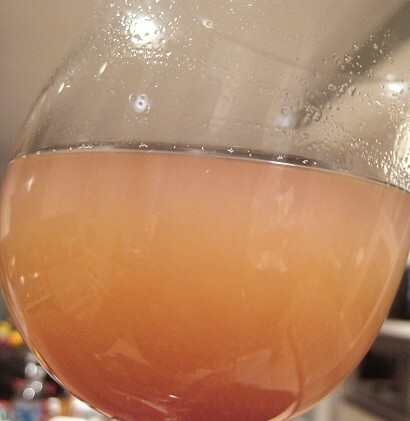 In your serving glass or a pitcher, add pineapple juice until halfway. 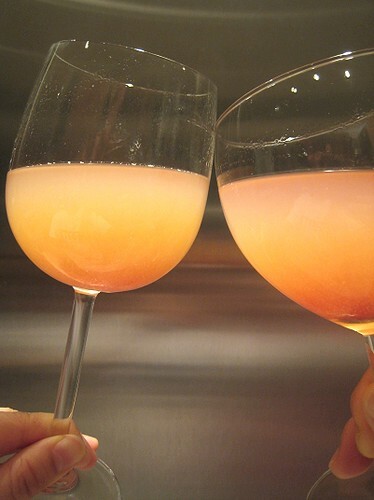 Add soda water or sparkling wine until your container is almost full. Add star anise syrup to taste. If using pomegranate ice, add them now. 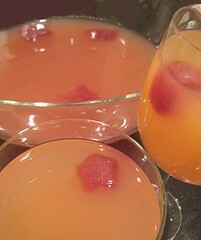 Or, simply add a touch of pomegranate juice for color. The ice cubes are so cute! This sounds really delicious, and yes, I will probably try it with some sparkling wine. Vodka perhaps, for that perfect pre-dinner sip? Kind of a pineapple-pomegranate cosmo? That's what I love about this kind of recipe...one idea leads to another. Looks great you guys....I'll be sharing this! 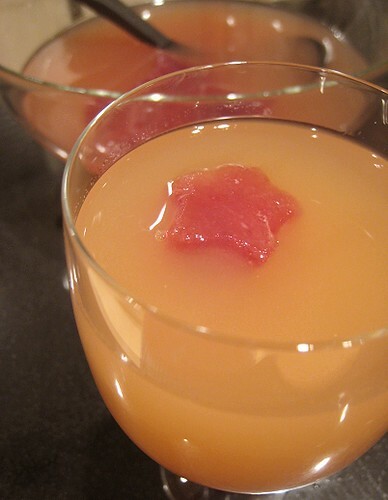 i love using anise in drinks and food such a a great spice!great looking cocktail! Great photos and wonderful idea for Valentines! This is an an amazing flavor combination. You two always develop the best combos! I tend to drink this with goggles. It's "pineappleing great!" I wish there was pumpernickel in there! Not even when you drink it in company of a chinchilla.